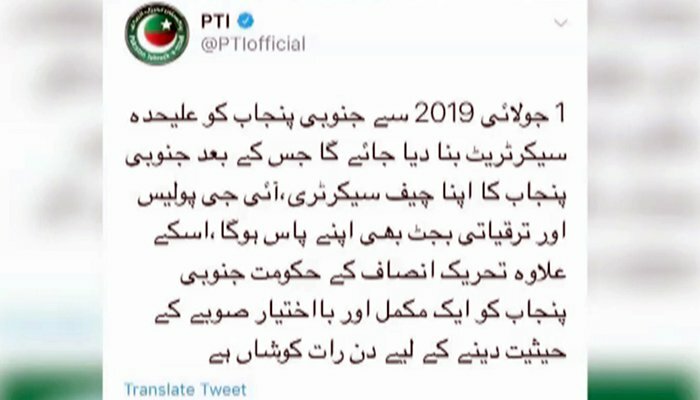 A tweet from the official account of the ruling Pakistan Tehreek-e-Insaf (PTI) about a separate secretariat for South Punjab has been deleted. According to reports, the tweet from PTI’s official account sent out last night said that from July 1, 2019, South Punjab will have a separate secretariat. The tweet added that in addition to a separate secretariat, South Punjab will also have its own chief secretary and inspector general of police along with its own development budget. Moreover, the tweet said that PTI is working day and night to make South Punjab an independent province. However, after the news was aired, the tweet was removed from the account.